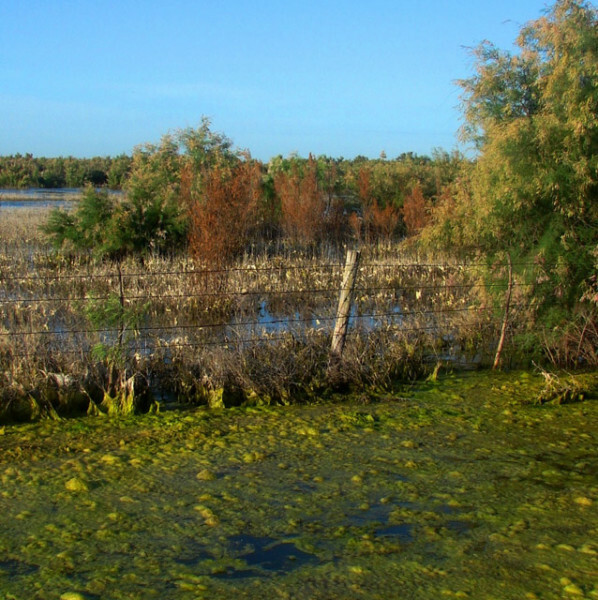 Playa lakes, such as Consavvy Lake in Midland County, often remain dry for decades. Consavvy Lake had last filled in the 1987 but the rainy spring of 2007 filled it up again. Wildlife found the “new” lake almost immediately. Toads emerged from the ground within two weeks baby toadlets were hopping by the hundreds of thousands away from the lake. 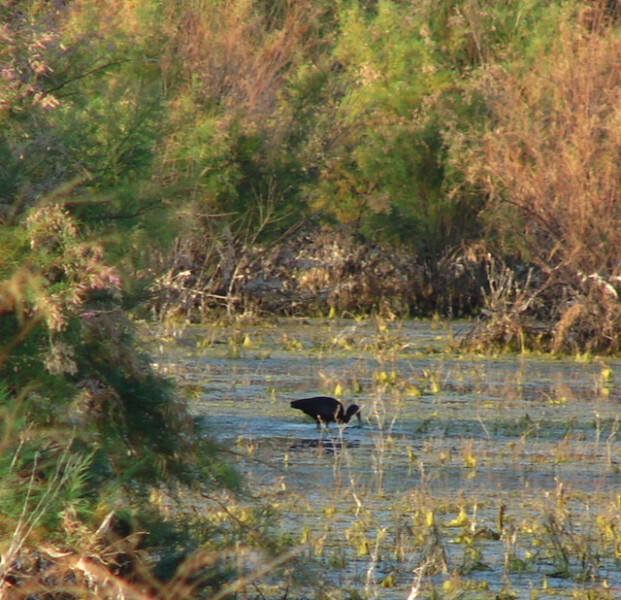 Coots, killdeer, and blacknecked stilts also found the lake, as did great-tailed grackles and red-winged blackbirds. The first three mentioned above soon began nesting at the playa. The barditch along the road filled with filamentous green algae, but beyond the fence line, open water beckoned. 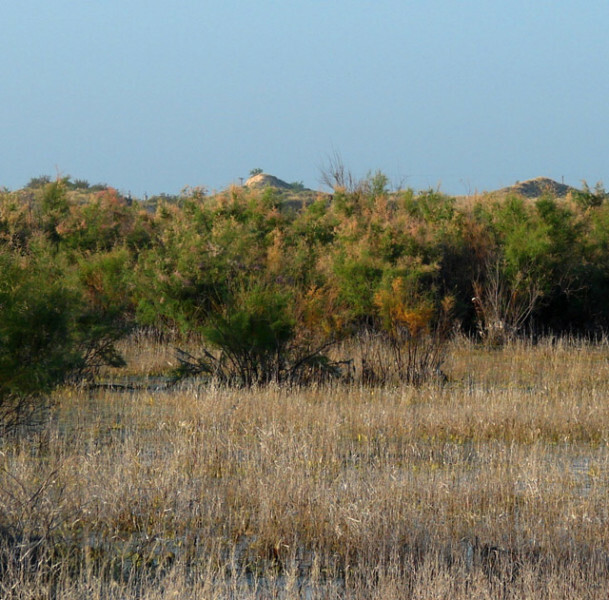 The salt cedar survived the inundation, but the seepwillow baccharis did not (the brown-red bushes.) This photograph was taken two weeks after inundation, and the dried green algae (now turned white) shows that it grew into the pasture at first. It hangs from dead weed stalks in the pasture. Some of the water became darkened with tannin, and algae did not grow in it. 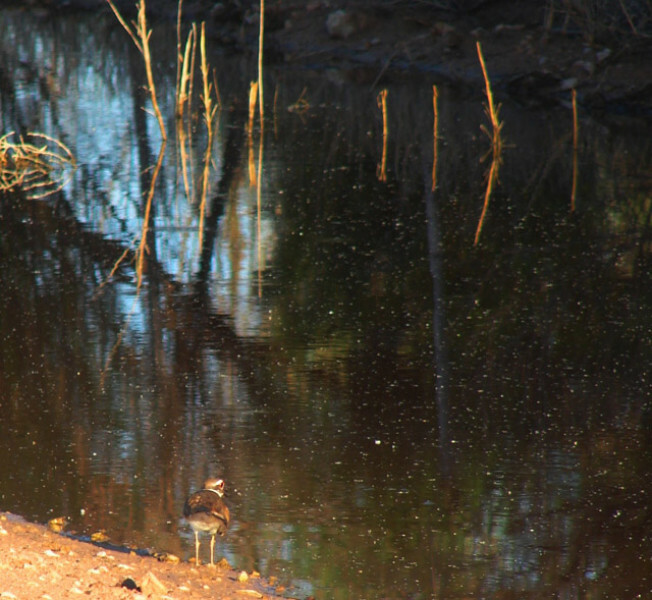 When the photographer arrived, a lone killdeer walked along the edge of the road next to the waterfilled barditch. 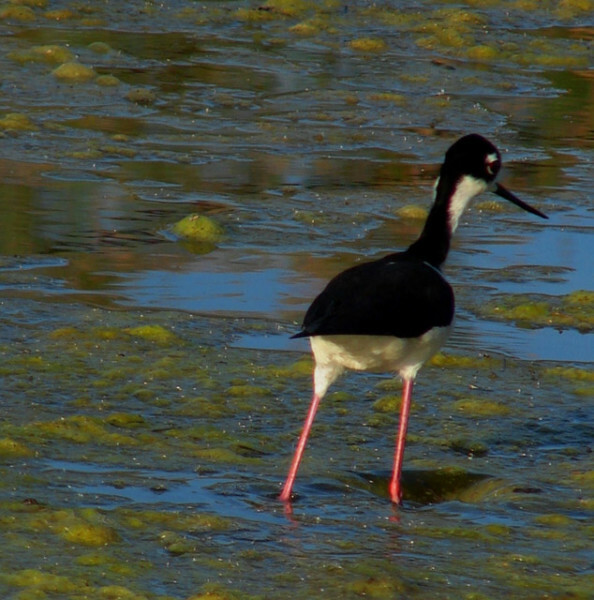 A lone blacknecked stilt walked in the algae-filled barditch on the other side of the road. The photographer parked and sat quietly. Another killdeer became visible when it stood up suddenly, not far from the first killdeer scurry along the edge of the water. It soon sat down. Killdeer scrape a small depression in gravel for a nest. The photographer elected to not investigate, but to continue watching the birds to see how they behaved. 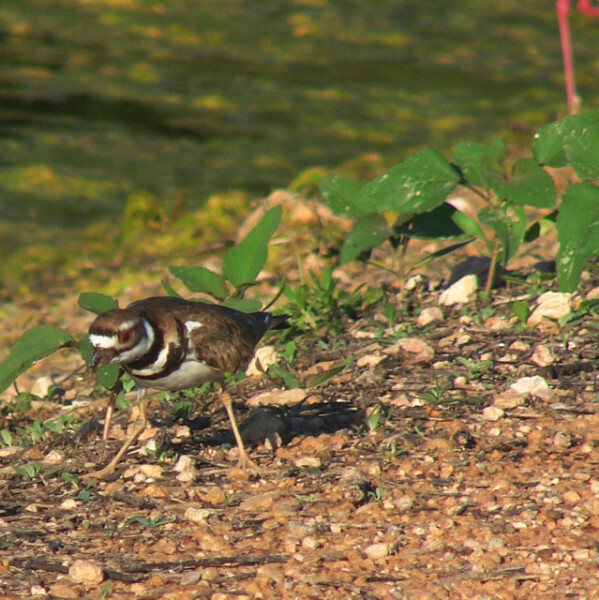 Baby killdeer can run within minutes of being born - so she had to be sitting on eggs. 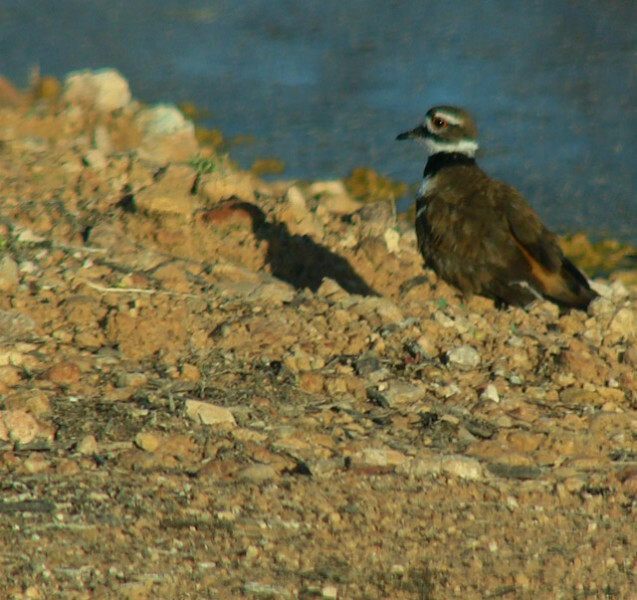 The other killdeer ran across the road and came near the photographer's vehicle. When animals are disturbed they often perform "displacement" behavior - "pretending" to be doing something while they are actually watching the new perceived threat intently. 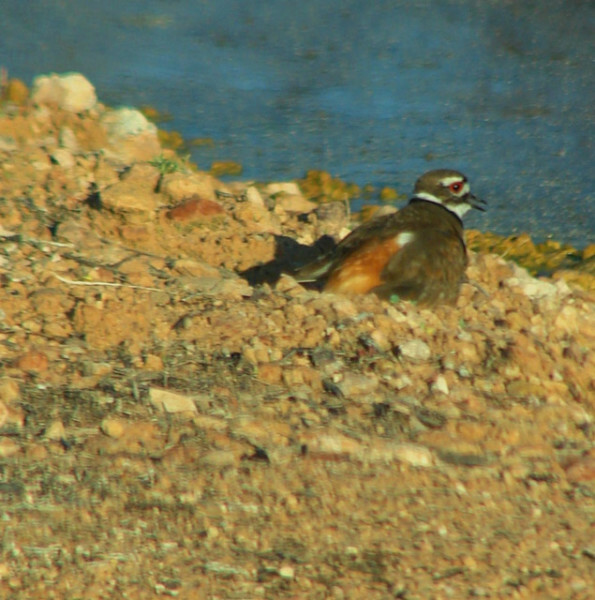 This killdeer pecked at the ground, as if catching a tiger beetle or some other tender morsel of food. 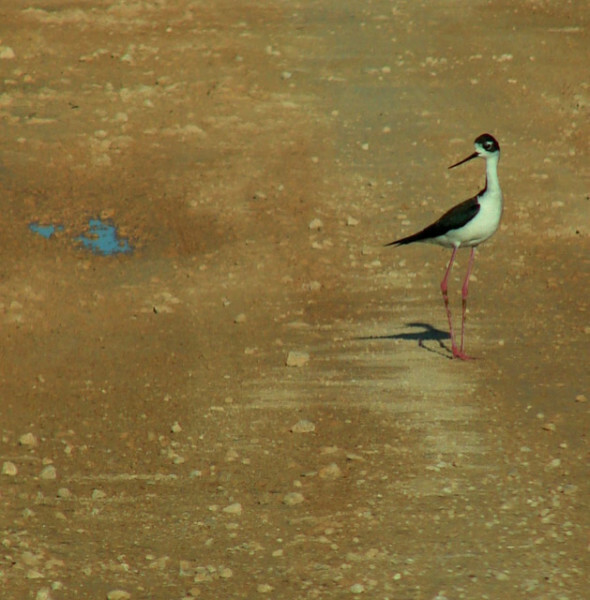 The lone blacknecked stilt walked towards the vehicle, as well. 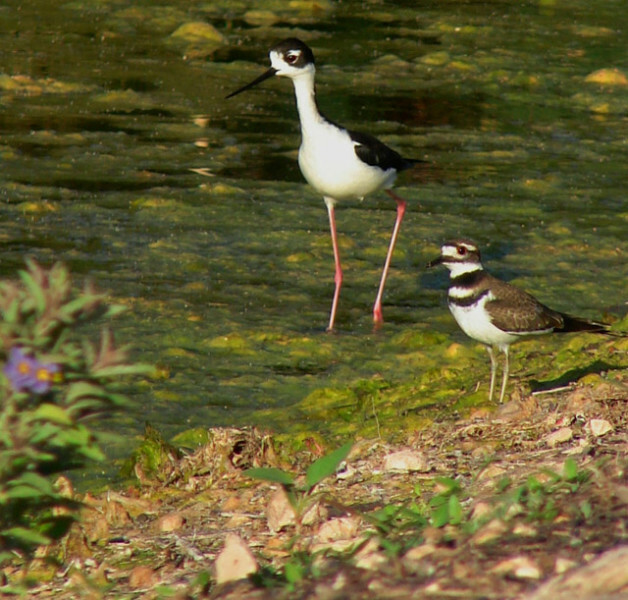 The killdeer watched it and the photographer. 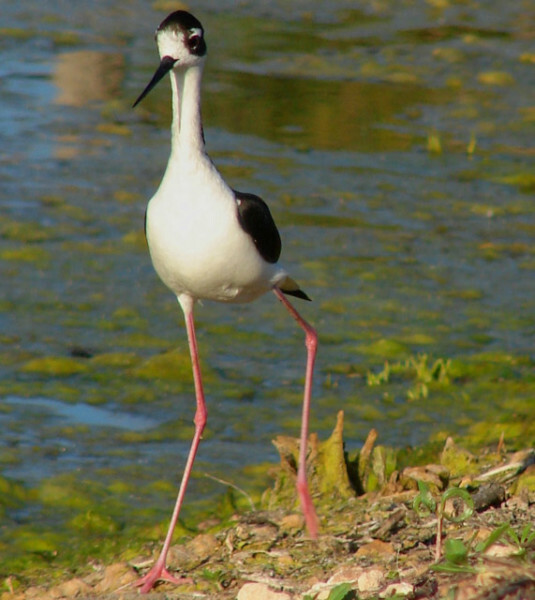 The stilt walked into the middle of the road, as if to investigate the dimensions of the photographer's vehicle. 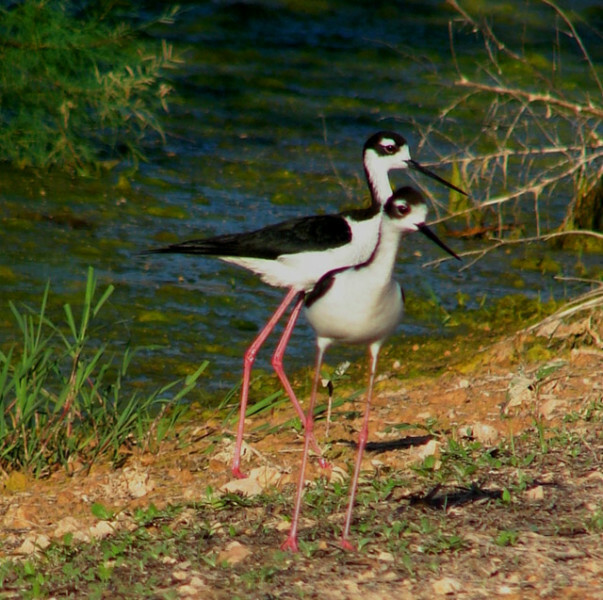 Another stilt arrived and the two seemed to confer for a minute. One waded away, down the barditch. The other began moving toward the photographer's vehicle. 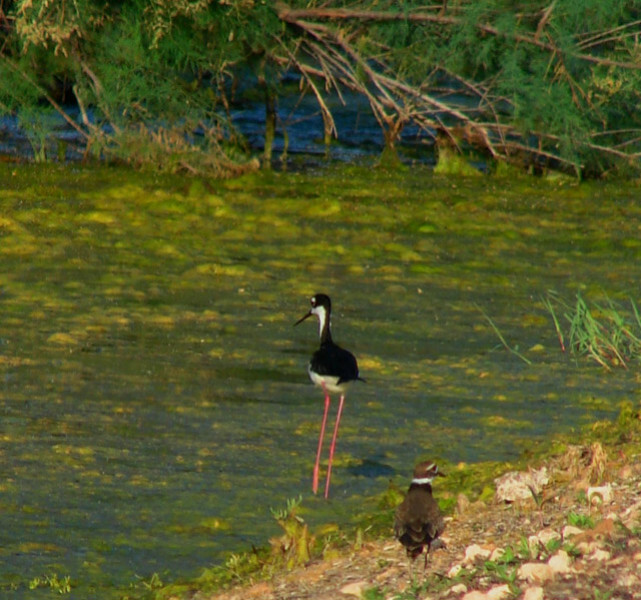 The long red legs of stilts make them very gangly and awkward appearing. As the stilt neared the vehicle, it moved back down into the water of the barditch. 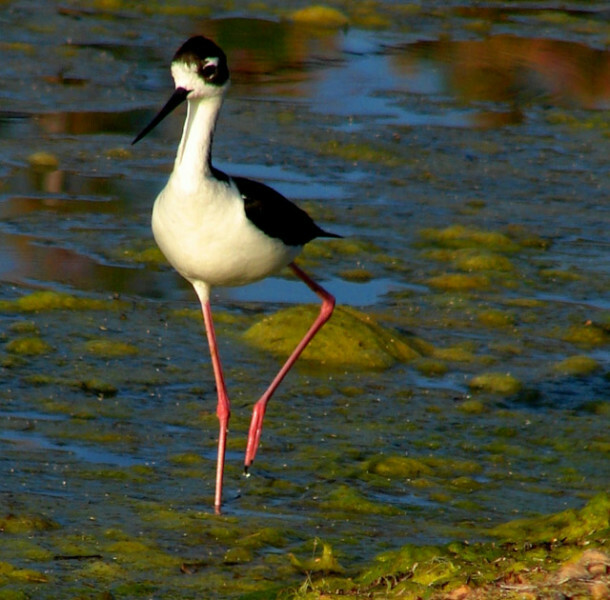 After approaching within 60 feet, the stilt reversed course and walked away for ten feet. It turned around and came back, then it stopped and foraged for food - at least it appeared to forage. 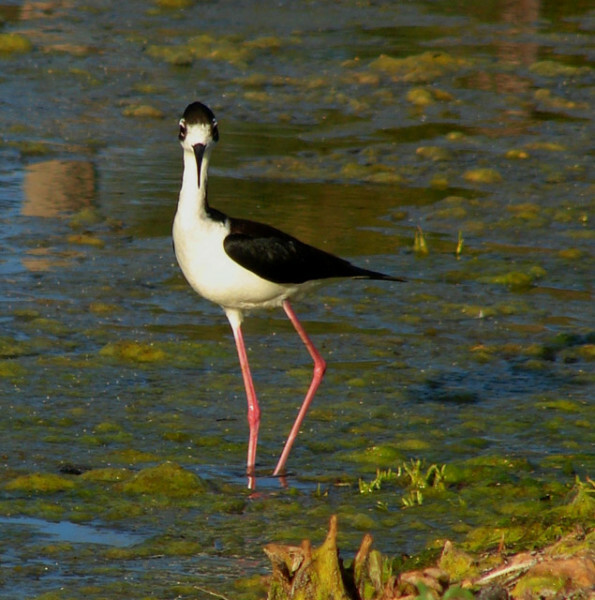 The stilt walked another ten feet closer. It abruptly began flicking its wings. A number of birds will quickly flick their wings to chase smaller animals and other birds away - but to flick its wings at a vehicle parked on a road seemed a little ineffectual. It twisted this way and flicked its wings. 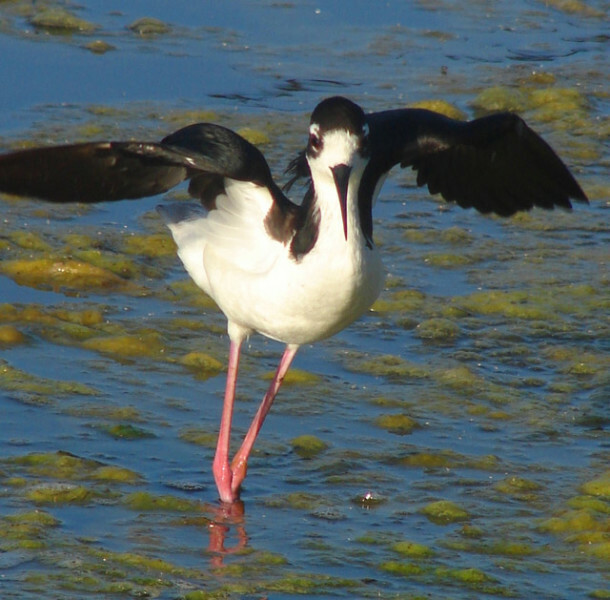 The stilt twisted back, and flicked its wings again. It continued the behavior for almost three minutes. 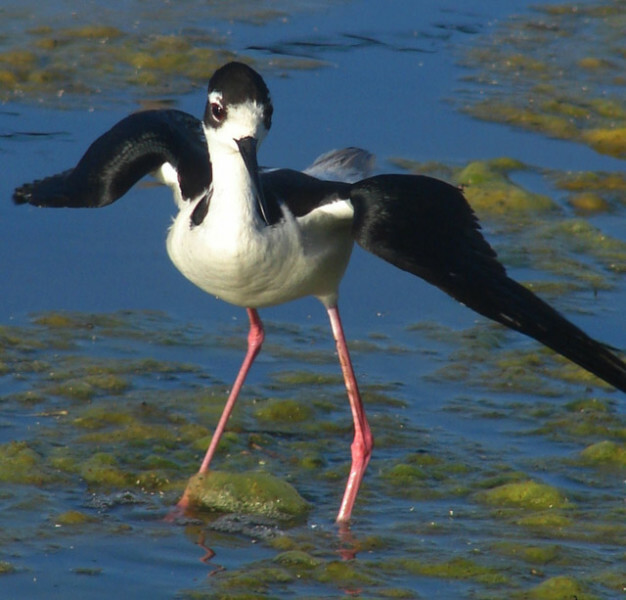 Without any obvious movement from the photographer or the vehicle, the stilt came out of the water and began flicking its wings while on the land. 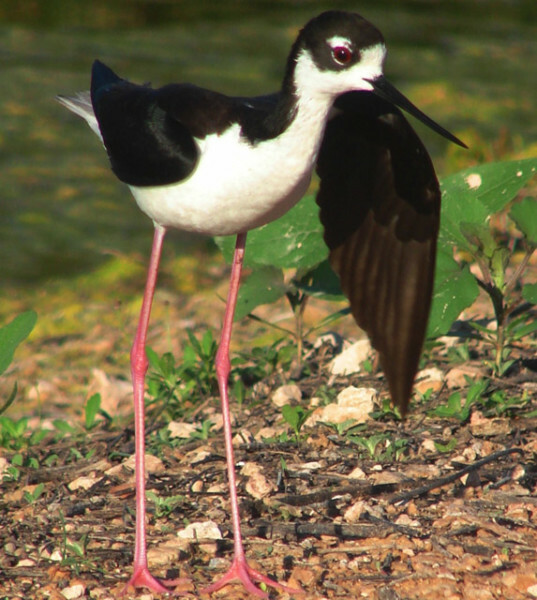 The other stilt ran up, as if to warn the displaying stilt that it was coming too close to the vehicle. 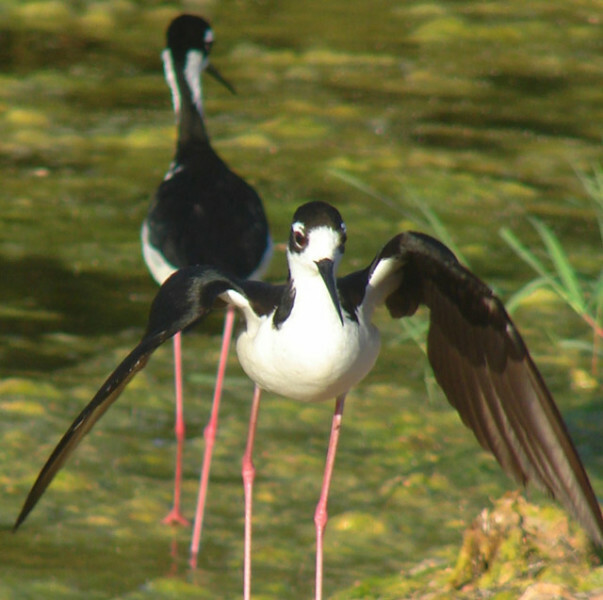 The displaying stilt ignored its mate. 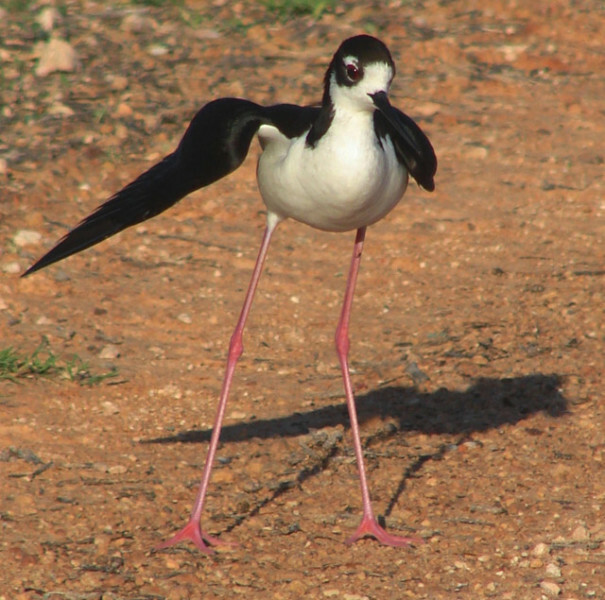 The displaying stilt walked out on the road and displayed right in front of the vehicle. It crouched down, spreading its wings, and then pressing its wings to the ground. This might have been a "hurt wing" display, which many birds do to draw a predator away from a nest. The predator comes close, believing it will have an easy meal, but then the bird flies away. 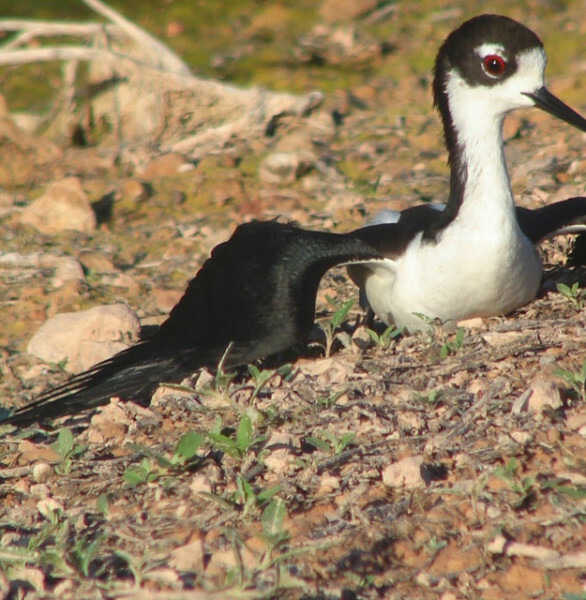 For 30 seconds the stilt arched its upper wing. 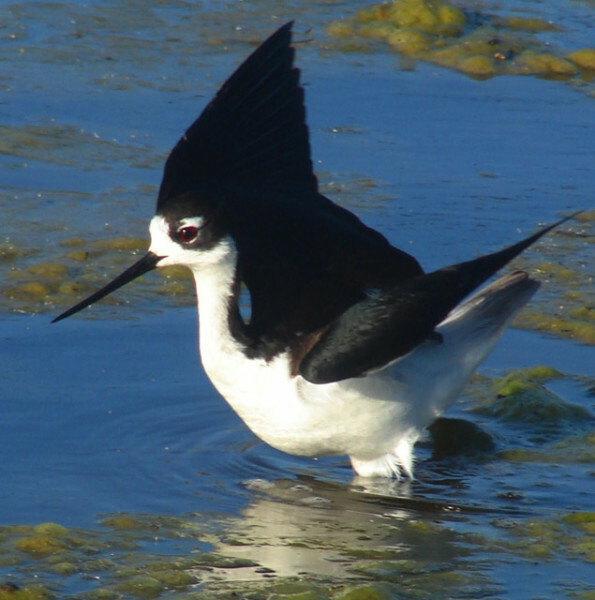 After the arched wing display, the stilt suddenly stood and flew away about 50 feet, where it lit in the water and began "foraging" again. The photographer decided that the birds had been disturbed for long enough, and drove away. 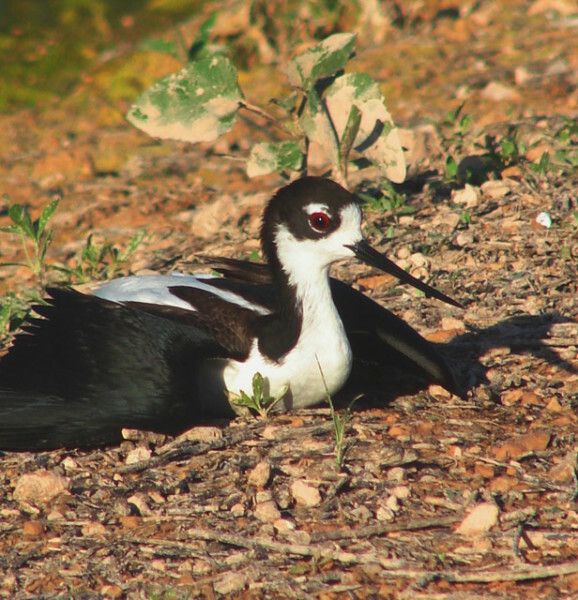 The location of the stilt's nest was not determined, despite over 20 minutes of observation. 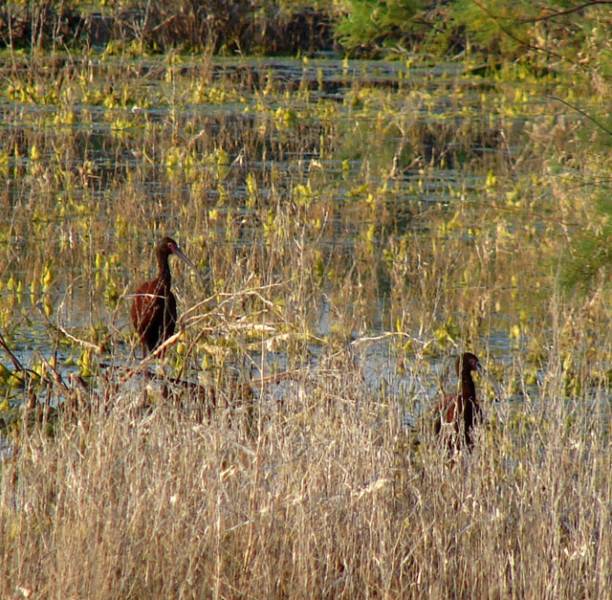 Whitefaced Ibis reappeared in Midland County in the rainy 2007 season. 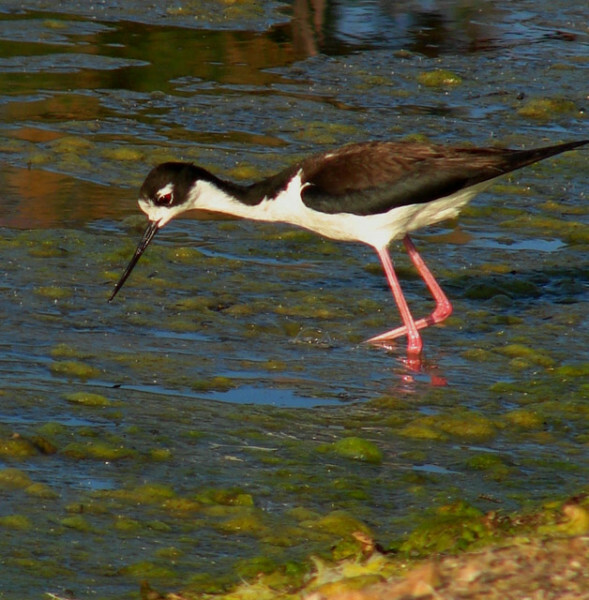 They are wading birds that feed on aquatic invertebrates and some plant material. When the photographer first spotted them, they spotted the photographer and watched to see if they should fly. Deciding that the photographer was not a threat, the ibis began to wade around poking into the water. When one bird began to find some tasty morsels, other birds noticed. 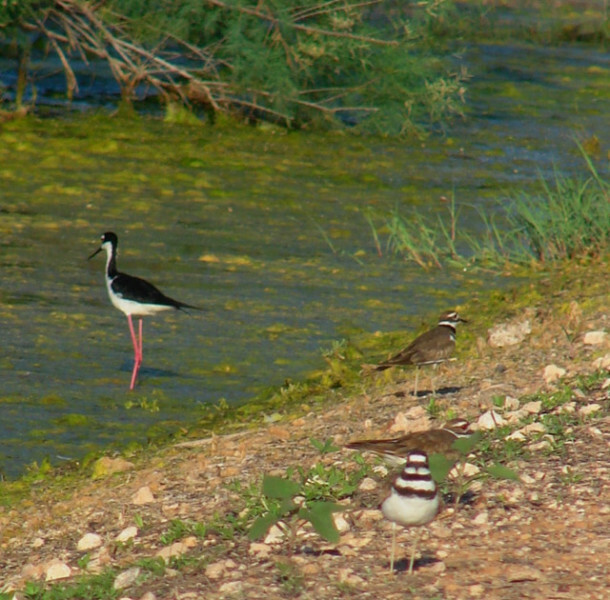 A blacknecked stilt joined several ibis. 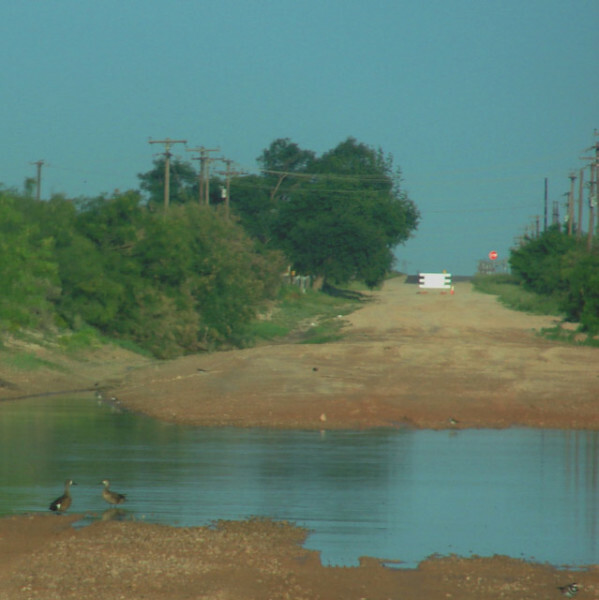 Far upstream on Monahans Draw, the Odessa sewage facility runs water a little ways down the draw. 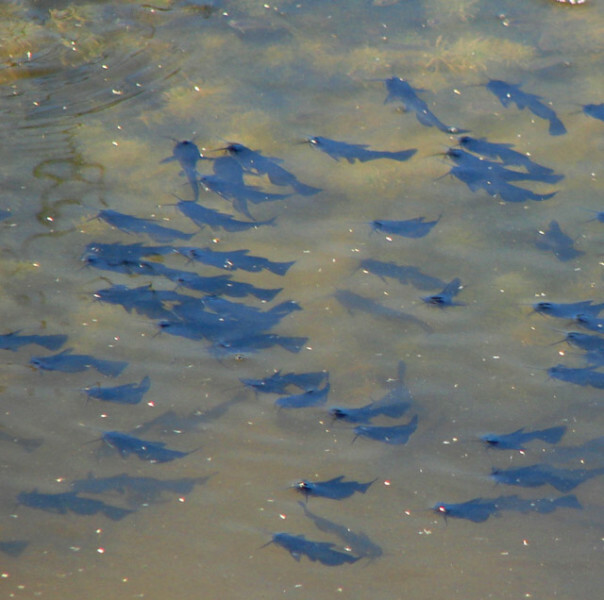 Ranchers along the draw have stocked black bullhead catfish for family fishing, but when the rains came, the "fry" were washed along the draw all the way to Consavvy Lake. These fish will die within a week, for they were left gasping for air as the water began to dry up in a backwater of the draw. 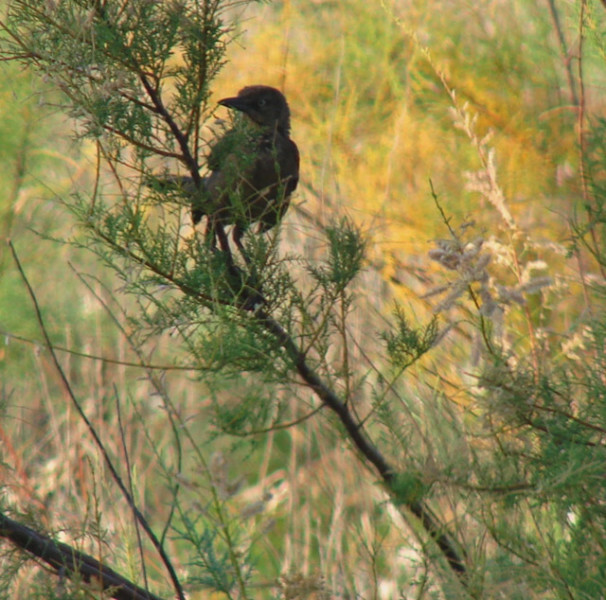 Greattailed grackles are always found where there is water. This female explored a salt cedar to catch insects. 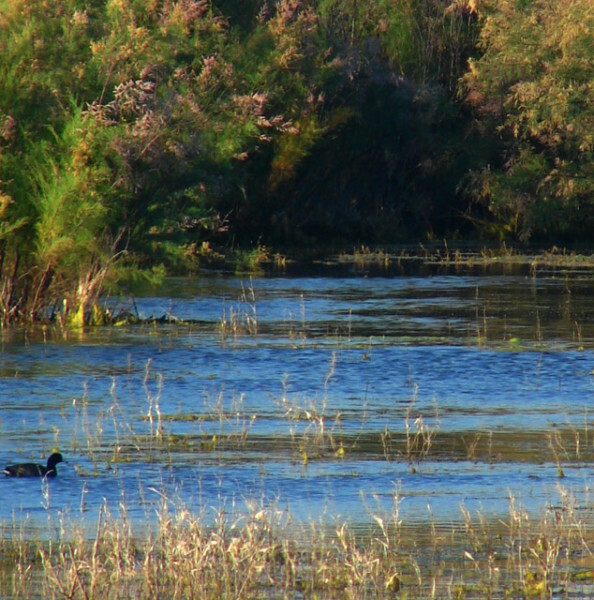 Consavvy Lake is near the steepest hill in Midland County, which can be seen over the salt cedar thicket of the playa.